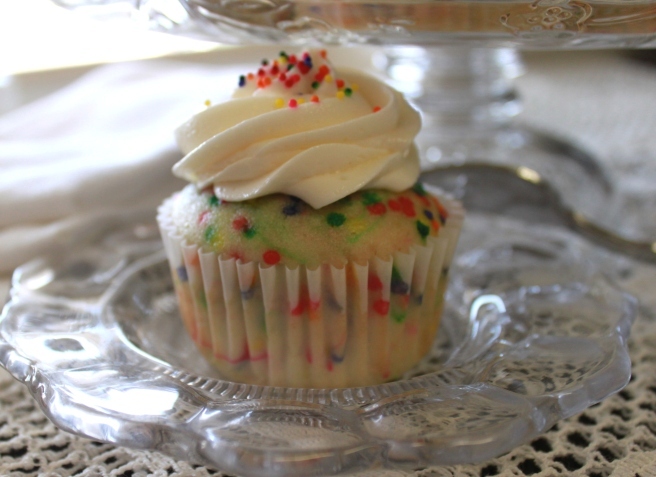 Funfetti Cupcakes | Rosetta Bakes! Grease and flour cupcake pan or use cupcake papers. In a small bowl, combine the flour, baking powder and salt. Stir together and set aside. In a bowl of a stand mixer, cream the butter and sugar until light and fluffy. Add the egg whites to the bowl and beat until combines. Add in the vanilla and almond extracts and mix until incorporated. Mix the dry ingredients in three additions, alternating with the milk, beginning and ending with the dry ingredients. Mix just until incorporated. Fold in sprinkles with a spatula. 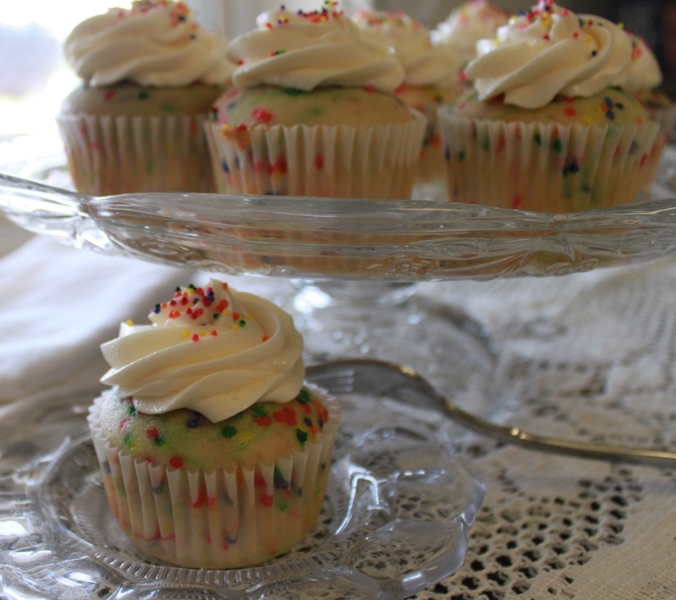 Divide the batter evenly in each cupcake section, or cake pans. Bake until a toothpick inserted in the middle comes out clean (about 16-18 minutes for cupcakes) about 30 to 40 minutes for cake. 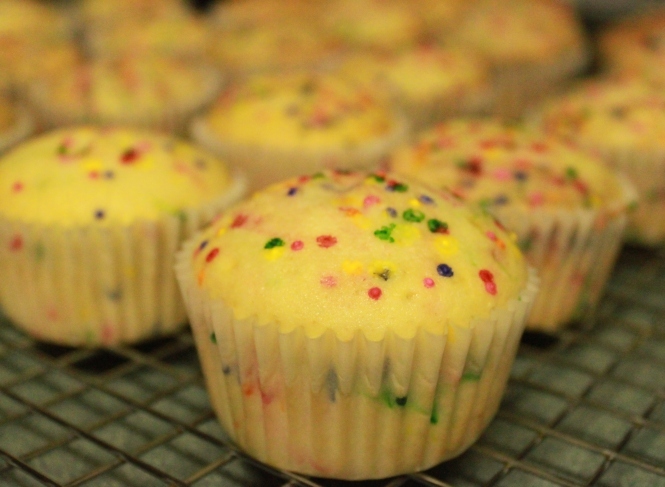 For cupcakes, remove from baking pan right away and cool on a cooling rack. Frost cupcakes as desired. 20 Tablespoons (2 -1/2 sticks) unsalted butter, softened. 2-1/2 cups confectioners’ sugar, sifted (for a thicker icing, add more confectioners’ sugar). 1 teaspoons vanilla extract (I also add 1/2 teaspoon almond extract to the icing). In a stand mixer fitted with the wisk attachment, beat butter at medium-high speed until smooth, about 20 seconds. Add confectioners’ sugar and salt; beat at medium-low speed until most of the sugar is moistened, about 45 seconds. Scrape down the bowl and beat at medium speed until incorporated, about 10 seconds. Then increase the speed to medium-high and beat until light and fluffy, about 4 minutes, scraping down bowl once or twice. Source: adapted from Annie’s Eats: which was adapted from: Baking Bites.